Loyalty programs are closely associated with the travel industry in the publicâ€™s mind (see: frequent flier miles)â€”and for good reason. New data from Phocuswright and Acxiom found that four in five US travelers were members of some type of travel-related loyalty program. Naturally, the point of such programs is to help drive revenues and add to the bottom line. eMarketer estimates that digital travel sales in the US will total $189.62 billion this year, with that figure growing to $219.69 billion by 2021. The Phocuswright and Acxiom survey, conducted in March, found that business travelers were more committed to loyalty programs than leisure travelers across pretty much every segment of the travel marketâ€”for the obvious reason that they are likely to travel more frequently. For instance, 62% of business travelers had signed up for a hotelâ€™s loyalty plan, compared with just 54% of leisure travelers. Similarly, the airline loyalty program sign-up rate was 60% for business travelers and 50% for leisure travelers. But while travel loyalty programs are popular among travelers themselves, they donâ€™t have nearly the same level of adoption among consumers overall, at least among certain age groups. 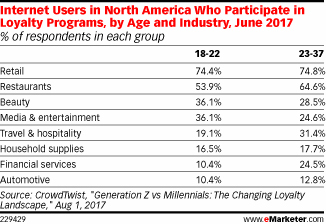 A survey of internet users in North America from CrowdTwist found that retail loyalty programs had the highest adoption rate among adults ages 18 to 37. Meanwhile, travel and hospitality programs were somewhere in the middle of the pack. Brands have a strong reason for providing loyalty programs to consumersâ€”they have a clear correlation with purchase influence among younger adults in the US. For example, a March survey from Lab42 found that 73% of respondents ages 23 to 36 named loyalty programs as having a significant effect on purchase decisions. But loyalty program providers also appear to have some work to do to improve their offerings. A poll of US loyalty program members conducted in February by Bond Brand Loyalty found less than half of respondents were satisfied with their loyalty programs in nearly every category (credit cards were the sole exception, with 52% of users expressing satisfaction). 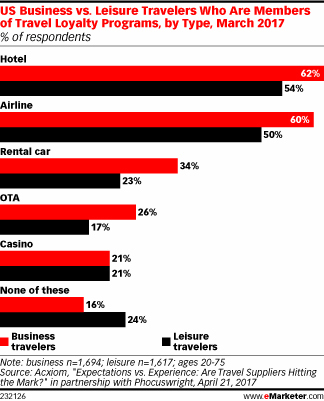 The airline and hotel categories did not fare well in that survey, either. Only 39% of respondents were satisfied with their airline program, with that figure dropping slightly to 38% among hotel loyalty users. Copyright 2018 eMarketer Inc. All rights reserved. From https://www.emarketer.com. By Rahul Chadha.